Do you enjoy a nice mani/pedi? Did you know that it’s just as important to care for your pet’s nails as well? In fact, one of the most popular à la carte services here at Puff & Fluff is the nail trim. And while you may enjoy a manicure for the aesthetics, your pet actually needs regular nail maintenance for their health. However, many pet owners find it difficult to cut their pet’s nails at home. Your pet may be skittish which can lead to injuries. Remember, if you are nervous about cutting or grinding your own dog’s nails, your pet will be nervous too. 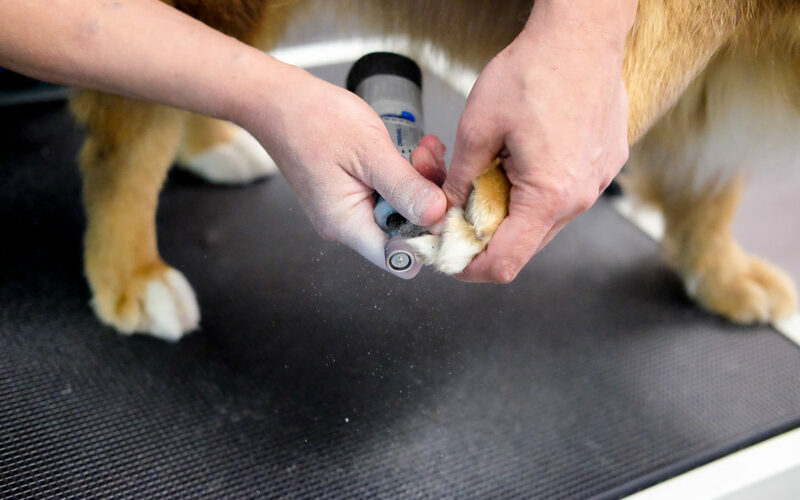 The feet are one of the most sensitive areas for any canine and if your pet has had a bad experience involving the feet, cutting the nails may be even more difficult. In this case, it’s best to bring your pet into a purr-fessional. Why is it scary and sometimes traumatic for dogs to get their nails done? It’s all about the quick. What’s that? The quick is the fleshy center of the nail where you’ll also find a vein. The longer the nail grows, the longer the quick grows with it. Cutting the nails too short can be very painful, but leaving the nails too long can also affect the way your pet walks. Without proper care, your pet can suffer from ingrown nails and/or infections. If you feel your pooch’s nails are still too long after a bath or groom, bring them back to your groomer every two weeks for a nail trim until their nails are at a good length. After that, the nails can be done monthly. Not only will your pup get used to the attention and become more comfortable, but the quick will slowly recede each time the nail is cut. How can you help prepare your pups for a pawdicure? This may sound silly, but we’ve dealt with a lot of dogs. To get your furry friend used to the idea of having their paws touched, stick your fingers in between their pads and tug gently on their toes every once in a while. You can even use a buzzy electric toothbrush to get them used to the sensation! Continue to bother them (lovingly, of course!) with these methods until they simply no longer respond. If you’re looking for something a little more fun, you can jump into our creative options at Puff & Fluff as well! Start with an adorable nail polish! Pick from our colors and then be sure to match your own for a truly adorable combination! We use polish specifically designed for dogs, so even if they chew on their nails, no harm will come to them. You can learn more about our grooming and nail services here!